During Michael Cohen’s testimony to the House Oversight and Reform Committee on Wednesday, February 27, Republicans had about five and a half hours to question him. Instead, they mounted an assault, which, for all their unity, persistence, and ferocity, backfired. The initial disappointment of the hearing was the sharp divide between parties. The first moments of each five-minute segment granted individual legislators clearly signaled which party was addressing Cohen. The Republicans were not just harsh; they were not just ferociously self-righteous and prudish; they were vicious. Their joint message quickly took shape because of its monotony: Once a liar always a liar. Nothing Cohen said, apparently for the rest of his life, could ever be believed. He was so completely discredited, so depraved, and so nasty that asking him a single question would stain their dignity. Instead Rep. Paul Gosar (AZ) lobbed the curiously incongruent rebuke: “Liar, liar, pants on fire.” If that recitation was worth any time of what another Republican called a hearing costing millions, then someone will have to explain it to me. The intensity and uniformity of the Republican exercise was also disturbing. After perfunctory expressions of sympathy for Cohen’s family, they lathered on a raw Cohen all the venom and contempt they had in their first minutes, then rubbed it in for all they were worth in the time remaining. Had Cohen been lashed to a block, he would have been, at the end of the hearing, unrecognizable. Had Republicans given him the chance, Cohen might have shed light on their straitlaced observations to broaden their perspective, but their remarks were undisguised barbs meant solely to wound, and – with luck – disable Cohen. Yes, the litany of Republican rebukes was monotonous, if vitriolic. But the nadir was hit during the performance of Rep. Carol Miller (WV). Following the Republican suit, she refused to ask Cohen questions, stating he was beneath contempt, apparently deserving not even a glance. She read from her notes instead, very carefully, listing all the valuable things she could have been doing with her time. (This was an optimistic and egotistical assumption on her part; as a freshman, she has no idea how effective she might be in her new environment, and judging by her showing at the hearing, the prognosis is not good.) But instead, Miller had been forced to come to the hearing of this vile and despicable character, a man of no credibility, a man who lied once which meant he will lie always, a man who was completely disgusting and … As she continued to read from her notes, the penny dropped: Her excoriation of Cohen was based on the sheet music handed out to each loyal Republican who had vowed to toe the line in order to unify the effort to defend Trump by trashing Cohen. That was why, for all their harmony, their voices were so off key. They were singing on the stage of the wrong event. This was an investigative hearing; they had been booked for a mini-rally for the Trump+us brand. They were the ones wasting this million-dollar opportunity, not Cohen. Cohen’s answer to all this should have been, Does it make any difference why I’m here answering questions? I’m here. I’m answering your questions, any questions, all questions. Take what I say, investigate it, refute it if you can. What Cohen did say was that out of deference to public skepticism, he had brought boxes that held records to corroborate what he said so they wouldn’t have to take his word for it. That was not welcome news. First came outraged surprise that Cohen had boxes of evidence. Next came the accusation that Cohen had been hoarding those boxes. Then came several questions, thick with sarcasm, of where might these boxes have been all this time and why they had not been made available to the investigation. Cohen’s answer that the boxes had been passed over by investigators was brushed off. The Republicans then derided Cohen’s boxes. Better, after all, not to take a bunch of boxes too seriously, especially if they could corroborate any of Cohen’s testimony. Better to pound on Cohen’s character instead, better to ask why Cohen would stay in the employ of a man he accused of such terrible things for 10 whole years. And they did. Then, remembering themselves and where they were, they self-righteously demanded the boxes be seized and … well, just seized. A point missed by all is what having a very important boss means when you are not just one of an army of staff, but a hand-picked employee with a one-to-one relationship with that boss. And Cohen’s boss was not just an important man; during Cohen’s tenure, Trump had become the most visible, closely tracked individual in the world. With a boss of that stature, you do not take liberties. You do nothing that might get your boss in trouble unless you get his permission first. You do not break the law on his behalf on your own initiative; you do not involve your boss in a potential scandal or lawsuit on your own initiative. You either do what they tell you to or what you know they intend you to do. Part of Cohen’s value over the years was that he knew what Trump wanted without forcing the man to articulate it. He understood Trump’s code. (Putin values such understanding highly as well, as does anyone who requires dirty deeds be done. The shadier the actions, the greater the value of such an employee.) Cohen knew his boss and he operated in close, if tacit, understanding of his needs and desires. He knew over 500 times when his boss wanted him to shake someone off, he knew what measures his boss would countenance, and he knew how far his boss would let him go to do it before reporting back for an explicit, if encrypted go-ahead. Cohen worked for Trump for 10 years because Cohen was doing the job. Let those comments expose the absurdity of the Republicans’ fond allegation that Cohen paid $130,000 to Stormy Daniels on his own initiative (after, of course, Cohen himself admitted he hadn’t). They fail to realize the cataclysmic fallout that would have rained down on his head if that was not what Trump had wanted. A payoff to Stormy could have severely jeopardized his boss’s position, which Cohen would not for worlds have risked. It did in fact miscarry, but not because Cohen was flying solo. Nor was Michael Flynn, the military man who understands the urgency of following the chain of command, flying solo vis-à-vis his Russian contacts. (I also don’t believe Flynn lied to Pence about those contacts unless Trump told him to, which also answers the question of whether Trump knew about them). Rogue actions at that level are dynamite; Cohen and Flynn wouldn’t have dared risking the success of the man they served, the man they respected, yes, the man they loved. Unfortunately the man they loved had bad judgment and was unscrupulous; when henchmen get caught, he slips away under cover of their flayed skins (more in Heartbreak). A minor example of an employee’s judgment reflecting canny understanding of what the boss wants without being expressly told occurred in a May 2018 meeting of two dozen communication staffers with President Trump. Special assistant Kelly Sadler said McCain’s opposition to Trump’s CIA pick, Gina Hapsel, didn’t matter. “He’s dying anyway.” Trump took the cruel comment in stride. There was no rebuke. But the remark became public, and Ms. Sadler was reprimanded, then let go as a result of public pressure, not Trump’s displeasure. The point to pay attention to: Sadler would never have made the comment unless she knew Trump would approve. A reminder that McCain would not be around much longer would cheer him. She might even get a pat on the head for it. So she came out with that. We humans have problems with liars and lies. The first problem is: Most of us cannot lie without causing ourselves a certain psychological disruption. Even telling a lie – one lie – is for most of us both an effort and a conscious decision about which we feel edgy for hours afterwards if not longer, hence the psychological disruption. We incorrectly assume the exercise is as strenuous and painful for liars. Our second problem: The bigger the lie, the harder for us to refute it because the body of information we require increases at least geometrically in relation to the size of the lie. If someone says, “You’re a fool,” well, there’s no refuting that; we would only prove the allegation by trying. But suppose someone says, “Black is white.” We’d say, no, “Black is black and white is white.” They would counter that we were basing our opinions on fake information. If we were conscientious and the point was worth it, we would hasten to archives and philosophers’ books to determine the source of why we believed and so boldly stated that white was white and black was black, and that, in fact, might well be the end of the argument. We would never appear again. Trump’s lies are like that. You have to be very clever to disprove those whoppers, partly because they are pulled deftly out of thin air with no substantiation and no psychological turmoil on Trump’s part whatsoever (although I believe I can now detect when Trump starts creeping out on limbs, even given the fact that his entire tree is shaky). However, with practice – we are getting a lot of that – it gets easier. Specific to the Cohen hearing, I cite just one Trump tweet: “He’s lying to reduce his prison time.” Plausible. It certainly harks back to very familiar territory in the human psyche. It is an act we readily believe someone would do. However, meant solely to discredit Cohen’s testimony, this one is readily debunked. The country’s top legal organizations staffed with highly competent experts – whom Trump is trying to discredit as well – are scrutinizing Cohen’s testimony for its veracity. False statements will not lead to reduced prison time, exposing Trump’s statement as patently false. Only Cohen’s true statements, information that advances ongoing investigations or provides leads to new ones, could result in a reduction of his sentence. And that is not a sure thing. So did Cohen show up at the hearing to lie to reduce his sentence? No. He’s trying as hard as he can to tell the truth, although we all saw that it is not easy for him. After all, he did spend a decade working for Trump, and the part of his job that was not fixing was lying. An ominous moment occurred when Senator Mark Meadows (NC) brought forward a young Black woman for display. The previous day, Rep. Matt Gaetz (FL) had threatened to expose Cohen’s extramarital behavior at the hearing. Well, here it is, was my initial reaction: the woman herself. She certainly acted like a woman pilloried for dallying with Cohen. A picture of helpless contrition, she stood with head bowed, mouth working slightly from shame and regret. But no. The Senator was presenting this woman as proof that Trump was not a racist, which Cohen had so basely stated. This Black woman, Meadows informed us, talking in capital letters, worked in the White House. Trump had hired her. Trump was no racist. But the woman did not substantiate the statement. Instead of standing proud and defiant as proof positive that her beloved boss cherished and valued her, she squirmed like a fish dangling from a hook. Meadows’ theatrics backfired. Something else was said by that demonstration, something vague, uncomfortable, and strange, and not what Meadows intended. In his opening statement, Cohen called Trump a racist, a con man, and a cheat. While the racist statement was handily dispatched by Meadows (see The Black Victim) and there were no takers for the cheat part, the attempt to refute the con man part was particularly sad. It went something like: He doesn’t seem like a con man to me. Dear Sir, a con man is someone capable of fooling even you. That is to say, you won’t know a con man until your pockets are empty, your ponies are gone, and you have only the dust to curse; and you’ll still feel a wistful affection for him. A con man inspires trust. You like him; you believe in him; you defend him. As Cohen warned: I did what you’re doing now. His message did not register. Trump is Little Con Man. Little Rocket Man and Putin are giants in the field, big con men who fool little con men. Trump can’t match their depth, their intelligence, or their cunning, one tactic of which is to flatter Trump by treating him as an equal – something Trump both craves and cherishes – when, in fact, he is their biggest mark ever. Trump, whose major flaw is vanity, is the only one who doesn’t know. Republicans taunted Cohen: You trashed our President but you worked for him for 10 years. How could you have worked for him for so long if he’s as terrible as you say? (I guess they meant to say he’s not that terrible but you are?) Cohen’s answer should have been “hindsight,” but Cohen’s answers were not as deft as I would have liked; deft is seldom what you become when a mob is holding your feet to the fire and your toes are crisping. Cohen might have called their attention to the density, opacity, and momentum of the human personality, its tenacious waywardness; its addiction problem, where addiction is not an idea swelling in the mind, but brain-generated chemicals that saturate the blood, a physical reality. Addiction arises from a multitude of powerful ambitions, and shaking it loose has engaged many of us in panicky, sweaty tussles we are ashamed to admit in part because they do dominate despite our best wishes and efforts. For years. For 10 years. For a lifetime. Sometimes unto death. So don’t ask what took Cohen so long to free himself. Ask, as some did, what changed him so profoundly as to enable him to break away. Finally, no one has ever pointed out what heartbreak Cohen’s story dramatizes. In one of the most memorable sound bites of the decade, Cohen said he would take a bullet for Trump. He meant it and was proud of it. That kind of courage, loyalty, and devotion is rare. So what caused Cohen to leave the Trump coterie? Something so intense and so shocking as to blight an intoxicating loyalty. What’s more, it was dealt by the very man Cohen would have died for. Cohen got caught. But that didn’t cause him to renounce Trump. Just the opposite, Cohen ventured intrepidly into the firestorms of controversy still loyal to and risking all for him. The FBI, the media, and the public bore down on him, and still he loved Trump, defended Trump, lied for Trump. Then came the big bang: As Cohen’s hide was getting slowly, fastidiously, democratically tacked to the wall, Trump decamped, leaving Cohen not as the last man at the outpost, holding down the fort, withstanding the siege, braving the hoards – all things Cohen had done for Trump for years. No, in getting caught, Cohen had become the enemy Trump now directed his army against. Cohen was the blackguard Trump was selling out to bolster the Trump brand Cohen had helped burnish for 10 years. Cohen was now grist, a blood-stained stepping stone, a mangled corpse tossed out into no-man’s-land. A sickening moment of clarity to be lying out there on that field open to enemy fire, friendly fire, all fire, the birds; a moment of clarity that pierced Cohen’s life. That’s when Cohen said, and meant, my family and my country come first. Yet even during the hearing, Cohen could see he was still in the service of Trump. Had he been forced down into the sulphurous pit the Republicans tried to thrust him into, his ashes would have in some way vindicated Trump. And again, it was no accident this was happening to him; it was what the boss wanted. 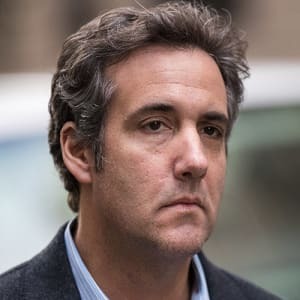 Cohen warned Trump’s new fixers: I’ve been where you are now; I know the man; you’ll be where I am if you keep this up. For all their rigour and righteousness, they just couldn’t hear a cry coming from the depths of the being of a convicted liar. Savage indignation severely and superbly harnessed. I was not only impressed with your analysis of these hearings but amazed by your energy for wading into the fray. You obviously still have hope. I am in a sort of torpor of despair. Amazed only that there still seems to be not a single righteous person among the Republicans. They are all cowering. Why when Trump is such a preposterous fool and flub a dub?